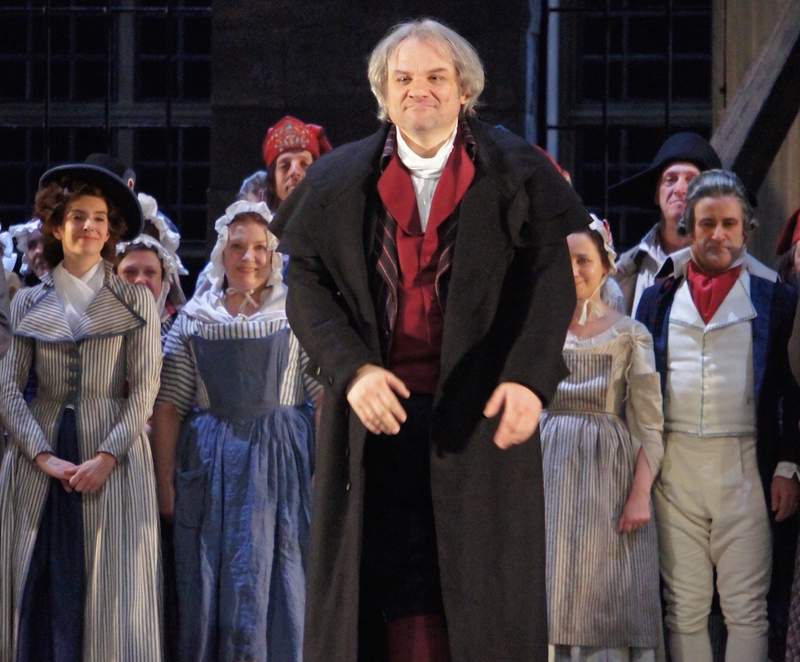 An artistic and vocal triumph, Royal Opera’s brand new production of Andrea Chénier is distinguished by its current starry cast, but is sure to remain a cherished production in the long term based on its sumptuous design and carefully considered story telling. 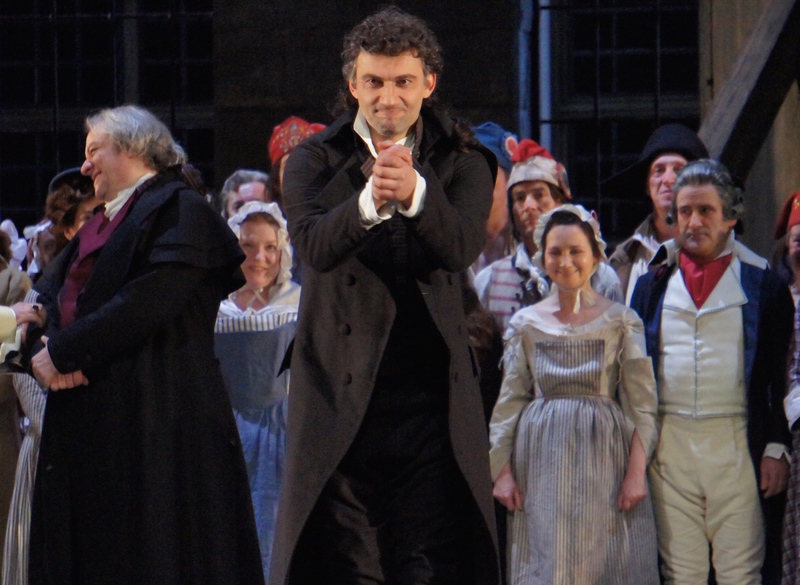 While the presence of über-tenor Jonas Kaufmann guarantees world attention and sold out houses, Royal Opera has not stinted in full company casting, bolstering Kaufmann’s presence with first-rate, well-chosen colleagues. The winners in this arrangement are the audience members, who have the chance to hear Giordano’s increasingly-rarely performed opera sung with uniform beauty and power. Director David McVicar’s new production takes on an eerily timely quality given the recent unrest in France. Stirred to action, crowds of people take to the streets to seek justice, their message strewn across graffiti-laden streets and makeshift signs. 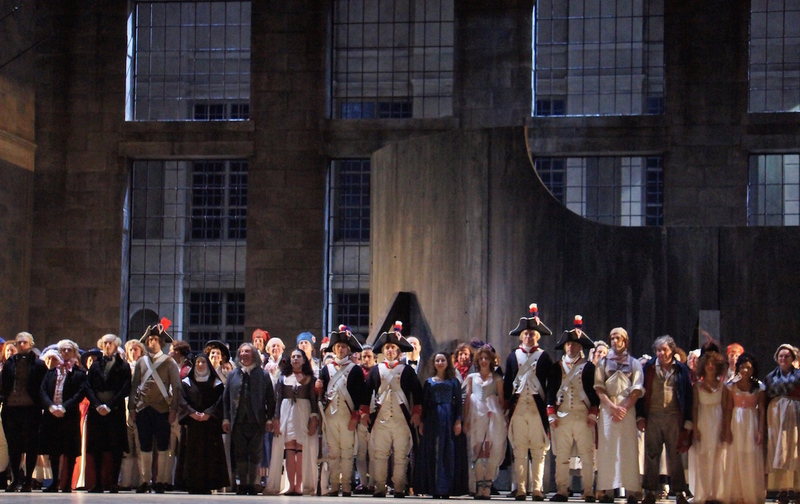 Using the traditional time and place of the opera, McVicar stages a brisk, but telling, snapshot of the social divide that led to the French Revolution, before elaborating on the subsequent machinations of the new regime under the rule of the people. 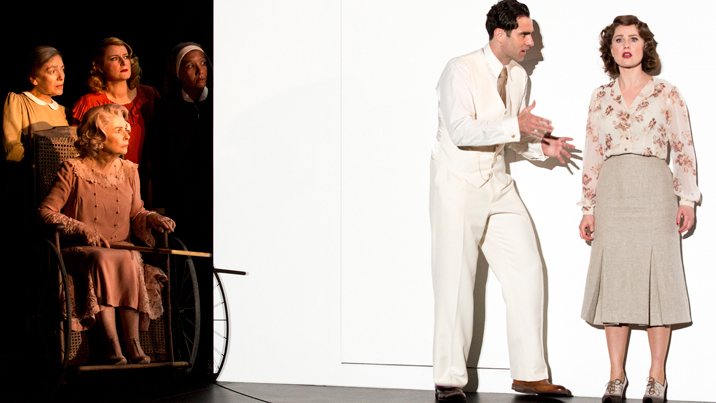 The relatively elaborate narrative of the opera is told with crystal clarity under McVicar’s meticulous direction, creating stirring drama and swoon-worthy romance. As the curtain rises, the most striking aspect is the utterly gorgeous scenic design of Robert Jones. The Winter Garden at the Château Coigny is a court of wonders, graced by multiple glistening crystal chandeliers and golden furniture. The crowning touch is the three rear decorative grottos with operational fountains. Liveried servants toil about thanklessly on one of their last days of oppression. Costume design Jenny Tiramani outfits the garden party guests in a parade of precious powdered pastels. If design can have an “arc,” in the same way as characters and plot, the spun confection of aristocratic elegance gives way to a sea of grittily patriotic reds and blues, before the final stage is one greys and blacks. The large set pieces travel through each act as part of this cleverly conceived design arc. 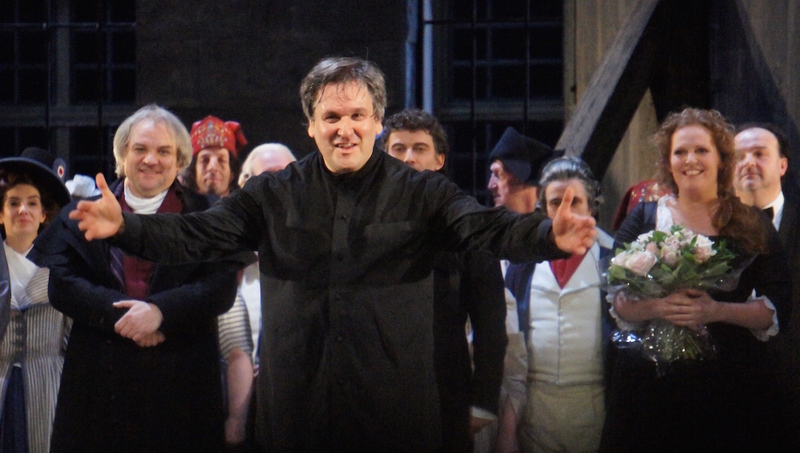 Under the inordinately skillful baton of Maestro Antonio Pappano, Giordano’s music is heard in all its sublime glory. Pappano’s painstaking knowledge of classic scores plays out here in a thrilling performance that expertly brings out the full range of dynamics and expression in the music. 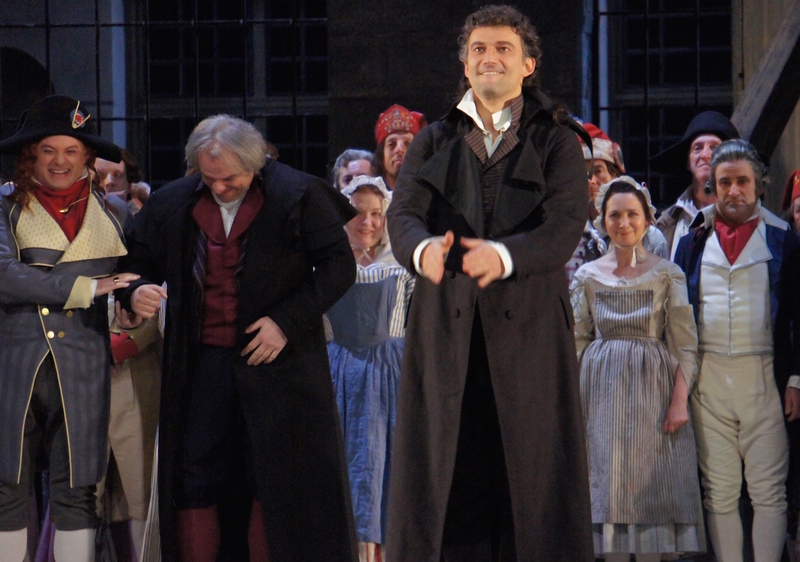 His luxurious tenor in absolutely superb form, Kaufmann gives a highly memorable performance as the titular poet, a man unwittingly swept into a charged political arena. 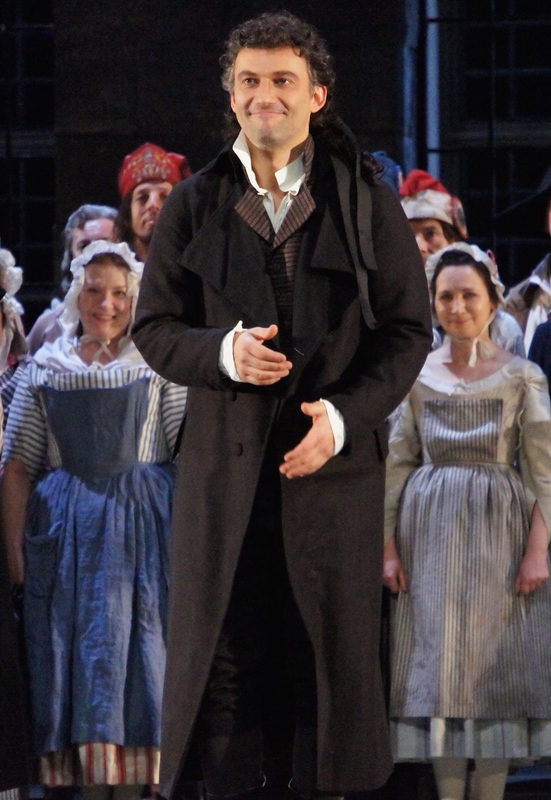 McVicar highlights Chénier’s position as an observer by having him downstage through the frivolous festivities of act one, perhaps indicating that the sensitive poet is aware that the party will be over all too soon. 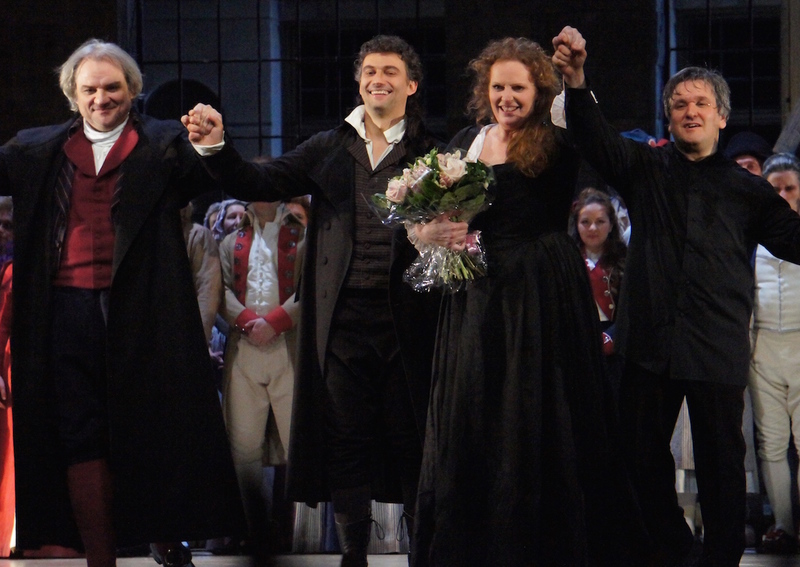 Looking every bit the dreamy romantic lead, with thick curly hair and glossy dark frockcoats, Kaufmann immerses himself in the role with quietly focused (rather than showy) acting. Demonstrating exacting preparation and divine skill, Kaufmann thrills with Chénier’s big arias “Un dì all’azzuro spazio” (heard in his Australian concerts this year) and “Come un bel dì di Maggio.” A particular thrilling quality on display is his ability to soar through a rapid crescendo on a high note. The darkly burnished tone of Kaufmann’s middle register proves an ideal fit to the dramatic elements of the music. 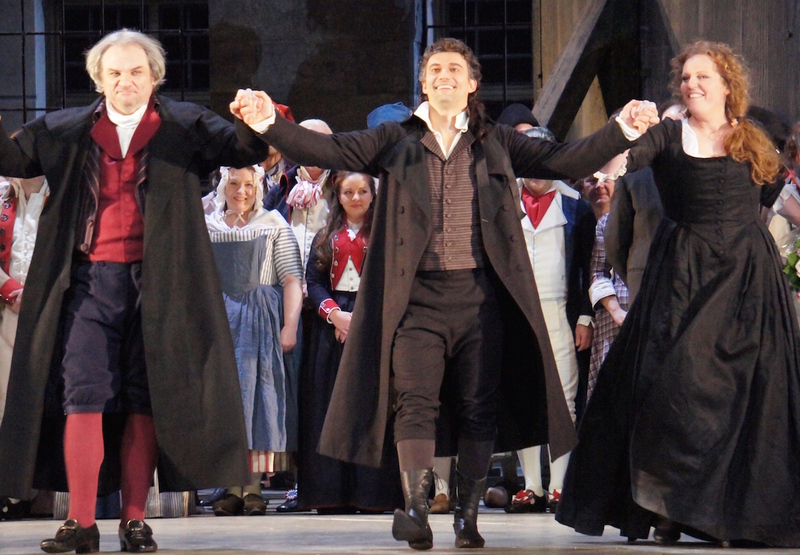 Rousing vocal fireworks aside, Kaufmann grounds his work in the authentic, human spirit of the role. 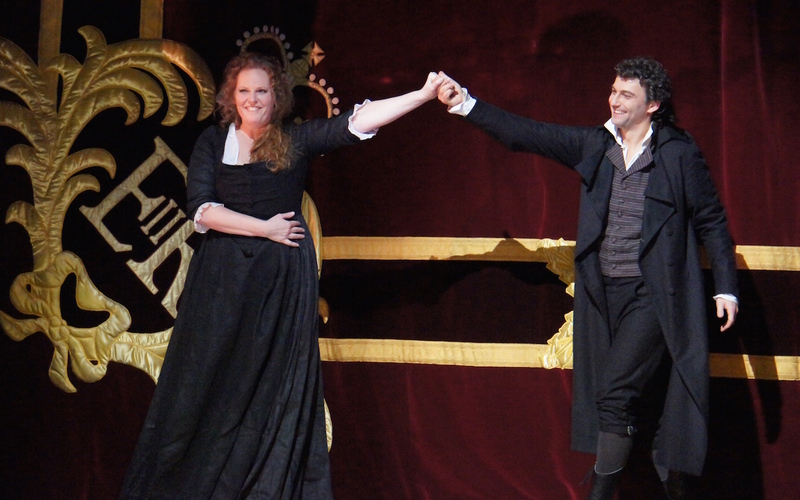 As the fallen woman Maddalena de Coigny, Dutch soprano Eva-Maria Westbroek is a sterling partner for Kaufmann. Westbroek’s gently voluptuous soprano quivers with emotion as she takes the character from carefree girl to desperate, love-struck woman. Particularly clear is the moment Maddalena falls in love with Chénier, as she gazes upon his forced poetry reading at the garden party. In a particularly masterful moment, Westbroek heightens the beauty of “Mamma morta” by keeping herself completely still. 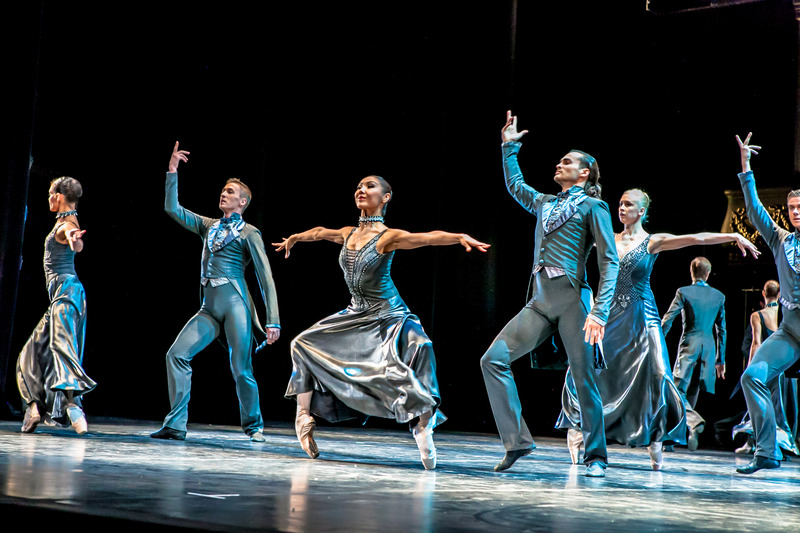 Westbroek more than holds her own in the romantic duets with Kaufmann, the pair finishing the opera on a divine high akin to the final pas de deux of a lead ballet pair. Also in pristine form is Željko Lučić, as insurgent servant turned popular revolutionary Carlo Gérard. 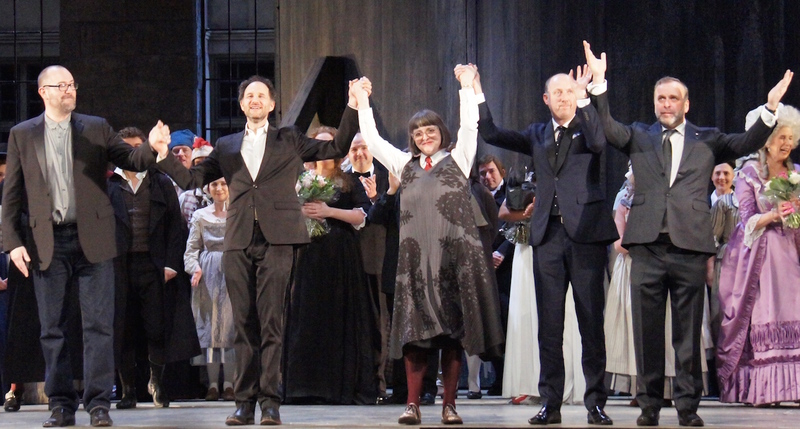 Lučić’s baritone pours forth with unwavering clarity, and he matches the tone of naturalistic acting with an unshowy characterisation of a man who comes to have everything but that which he most desires. Elena Zilio has a charming cameo as the selfless Madelon. 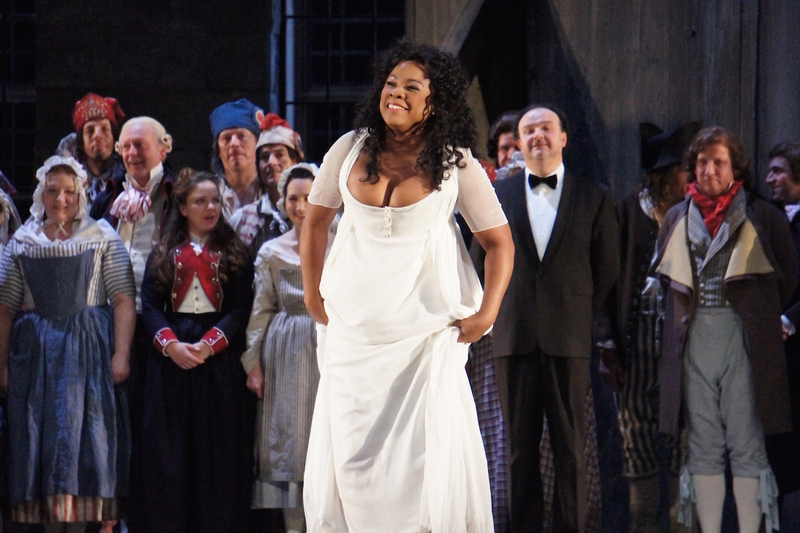 Although singing te role perfectly well, Denyce Graves seems altogether far too glamorous as mulatto servant Bersi. Rosalind Plowright delights as Contessa de Coigny. 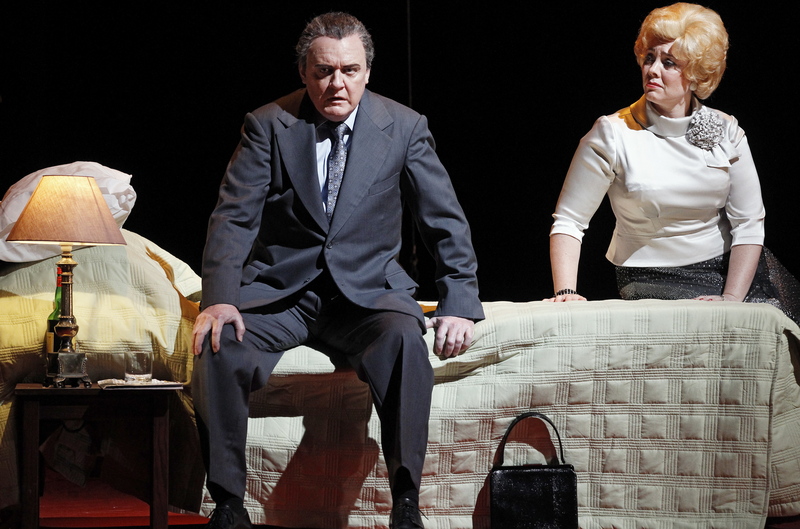 It is a thrill to see redoubtable bass Peter Coleman-Wright as Pietro Fléville. 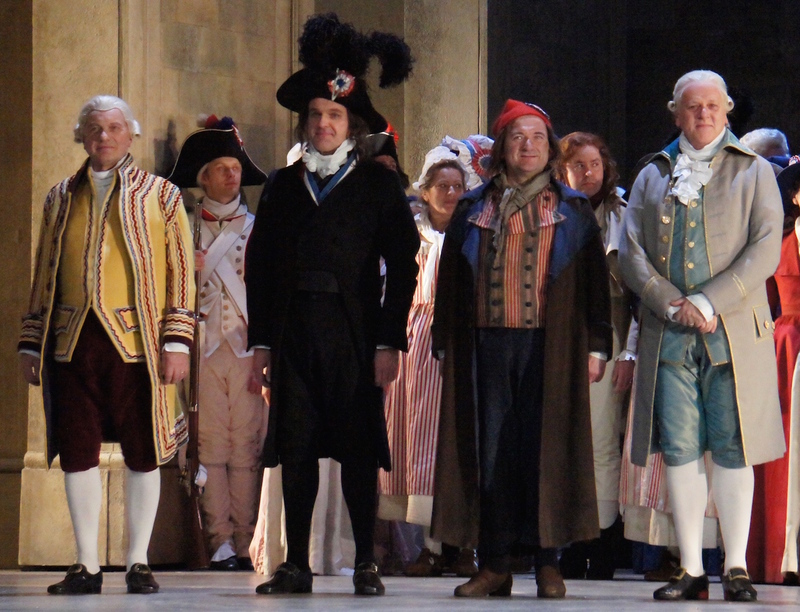 Renato Balsadonna’s preparation of the Royal Opera Chorus is faultless. 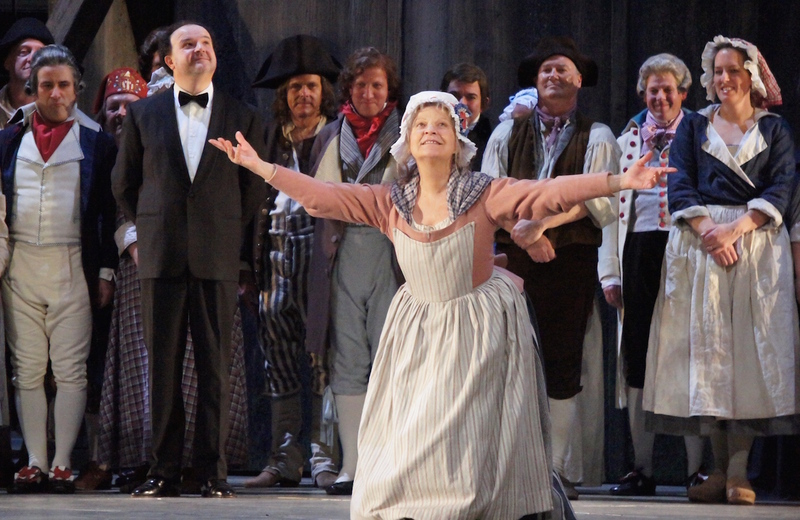 Andrea Chénier live in cinemas, as part of the current Royal Opera House Live Cinema Season, will be seen on 29 January 2015 and then around the world. Thanks Caroline. 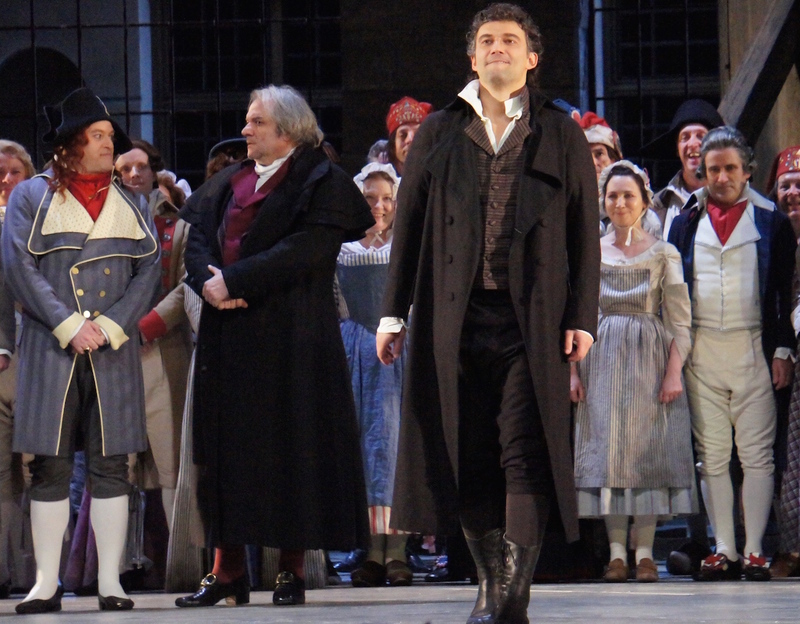 I am jealous that you can watch Andrea Chenier in the cinema this evening. I am back in Australia now and it is not showing here until a few weeks from now. I will be there to watch again though when it does screen – loved it!